On the campaign trail, Mayor Pete Buttigieg, a Democratic presidential hopeful, frequently anchors his stump speeches and interviews in a message of unity and bringing the whole country together, but over the last week, his sharper rhetoric aimed at Vice President Mike Pence has brought their complicated relationship under scrutiny. “I’m not interested in feuding with the vice president, but if he wanted to clear this up, he could come out today and say he’s changed his mind that it shouldn’t be legal to discriminate against anybody in this country for who they are. That’s all,” the South Bend mayor, who is gay, said on “The Ellen DeGeneres Show” Friday. 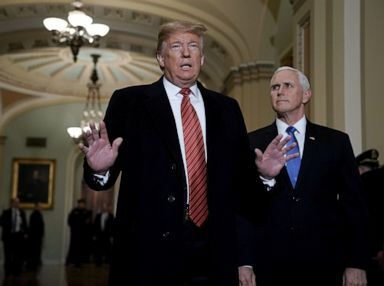 “I hope that Pete will offer more to the American people than attacks on my Christian faith or attacks on the president as he seeks the highest office in the land," Pence said in an exclusive interview with CNN Friday. In this May 1, 2015, file photo, then-Indiana Gov. Mike Pence, right, talks with South Bend Mayor Pete Buttigieg during a visit to recap the legislative session that ends in South Bend. "We worked very closely together when I was governor and I considered him a friend," Pence told CNN. "He knows I don't have a problem with him. I don't believe in discrimination against anybody. I treat everybody the way I want to be treated." Buttigieg began trading barbs with the vice president on Sunday, when he told the crowd at an LGBTQ event, “If me being gay was a choice, it was a choice that was made far, far above my pay grade. That's the thing I wish the Mike Pences of the world would understand. That if you got a problem with who I am, your problem is not with me -- your quarrel, sir, is with my creator." President Donald Trump and Vice President Mike Pence arrive at the Capitol to attend the weekly Republican Senate policy luncheon, Jan. 9, 2019. 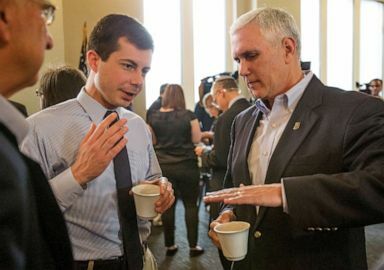 Pence's press secretary immediately responded to Buttigieg's comments, writing in a tweet, "The last time we recall Pence even mentioned @PeteButtigieg was in 2015, after news that Pete came out, Pence said: 'I hold Mayor Buttigieg in the highest personal regard. I see him as a dedicated public servant and a patriot.'" ABC News' Justin Gomez contributed to this report.